Theodor W. Adorno (1903-1969) was the leading philosopher of the first generation of the Frankfurt School and is best known for his contributions to aesthetics and social theory. In this highly original contribution to the literature on Adorno, J.M. 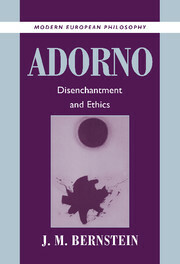 Bernstein offers the first attempt in any language to provide an account of the ethical theory latent in Adorno's writings. This book will be widely acknowledged as the standard work on Adorno's ethics and will interest professionals and students of philosophy, political theory, sociology, history of ideas, art history and music. Introduction; 1. Wrong life cannot be lived rightly; 2. Disenchantment: the skepticism of enlightened reason; 3. The instrumentality of moral reason; 4. Mastered by nature: abstraction, independence, and the simple concept; 5. Interlude: three versions of modernity; 6. Disenchanting identity: the complex concept; 7. Toward an ethic of nonidentity; 8. After Auschwitz; 9. Ethical modernism.